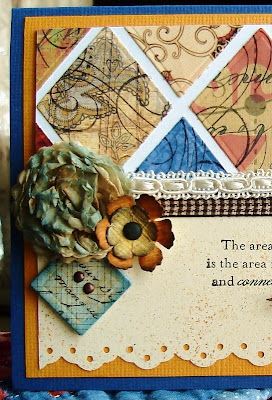 Today I’m posting two cards that uses small scraps of printed papers. Do you save every little scrap of paper? Well now it’s became such a mess that I don’t know if I’m coming or going! So I thought this would be a start on cutting down on the mess. Even the tissue flower is from scraps of packing tissue, and the paper button is scraps. Using Spellbinders Classic Diamonds, (second smallest die) cut diamonds and place them on point, repeat until you fill a standard 5 ½ x 4 ¼ card front. Trim off edges, trim to size and cut in half. Bingo two card fronts. Verse is from A-Muse Studio’s. For my second card, which was really fun and I haven’t used this corner punch sense my Scrapbooking days. Punch four corners and set them on point, tape them on the back, cut four more, keep adding until you have the front done. My verse is from Stampendous. Thanks for your time today, have a great week-end. These are brilliant! 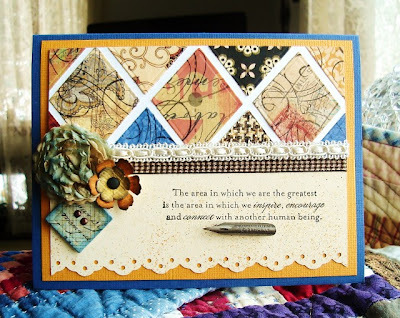 Your use of the shapes really makes these stand out, much more than the average quilt card. I will definitely be CASEing these! 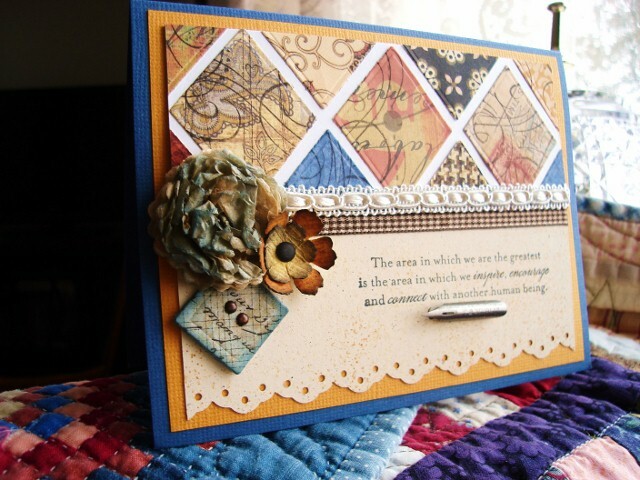 Great use of scraps Vada. the second one reminds me of a well loved quilt. Beautiful! Oh, Vada.....you've inspired me....these are amazing. Thank you for sharing....I was feeing longely without Mojo, but I think he's back!!! Yes, I am a scrap saver and at times wonder why I need a piece of paper so small! What is that? Were we deprived as children?? Vada, you did put your scraps to great use! Both are just like quilts and I really love those flowers! Have a great evening! Hugs! Vada they are wonderful! I love the first card and the second card had me amazed. Especially since you mentioned the corner punch. It took me a few minutes to figure out what part was punched, lol. Brilliant! I love what you have done with your scraps of paper - it's fabulous. Two magnificent cards! 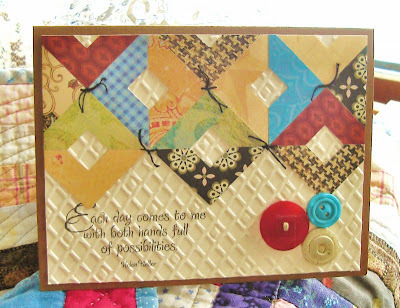 You certainly made beautiful use of those scraps! 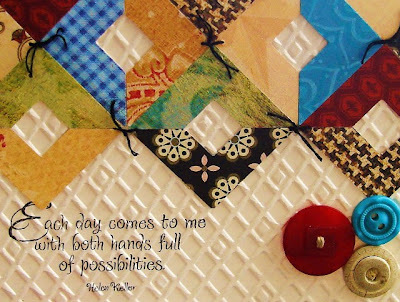 These are fabulous ideas for using scraps! Great cards!!!! Wonderful use of scraps Ms. V! Both are beautiful! Aaaah, yes.... that's what I'm saving them for! Your cards are just lovely.